As the California drought deepens, I am exploring the world of succulents. It seems these plants are wired to adapt and survive, no matter what. Knocked to the ground? No problem. Separated from the rest of the plant? Keep on growing. Hanging upside down? Sprout roots anyway. 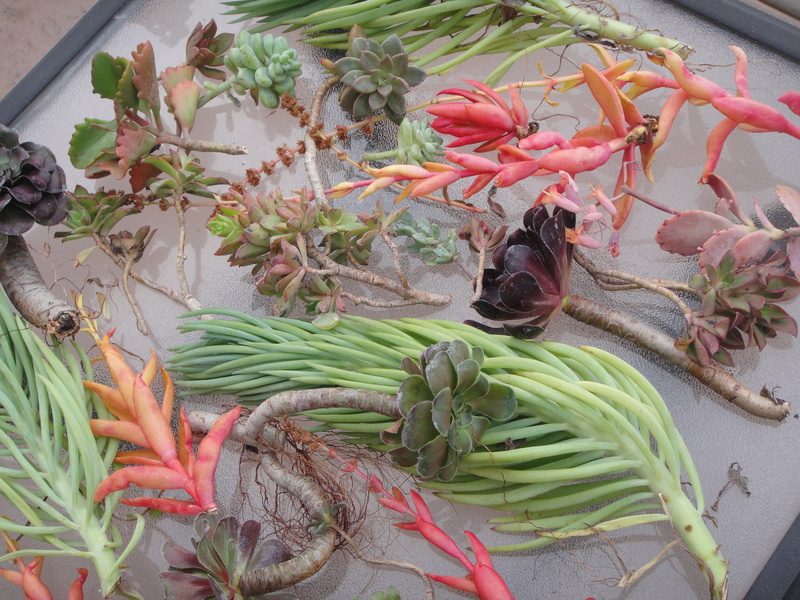 Succulents are resilient in the face of drought. They propagate easily. They adapt to adverse environments, not only surviving but growing. My first steps in transforming my gardens to be less water dependent were to ask questions and read. I learned that a branch broken off a succulent will root without extra attention. Just put it in soil and watch it grow. I learned that an agave leaf, if left alone on slightly damp soil out of direct sunlight sends roots into the soil, drawing its sustenance from the mother leaf. “All that is required for a succulent to root is viable growth tissue,” writes Debra Lee Baldwin in Succulent Container Gardens (p. 234). Next comes experimentation. On a friend’s advice, I am putting cuttings from succulents I already own into pots that I’ll sprinkle among my other plants. I discovered our dogs had knocked some branches off our plants. Some had fallen to the ground and were starting to grow roots. Another was hanging upside down with its broken end pointing to the sky. It had grown roots eight inches long that dangled from its end. I added these to cuttings from my favorite succulents, set them on a tray for a week to become calloused at the cut, then stuck them in pots filled with cactus soil. 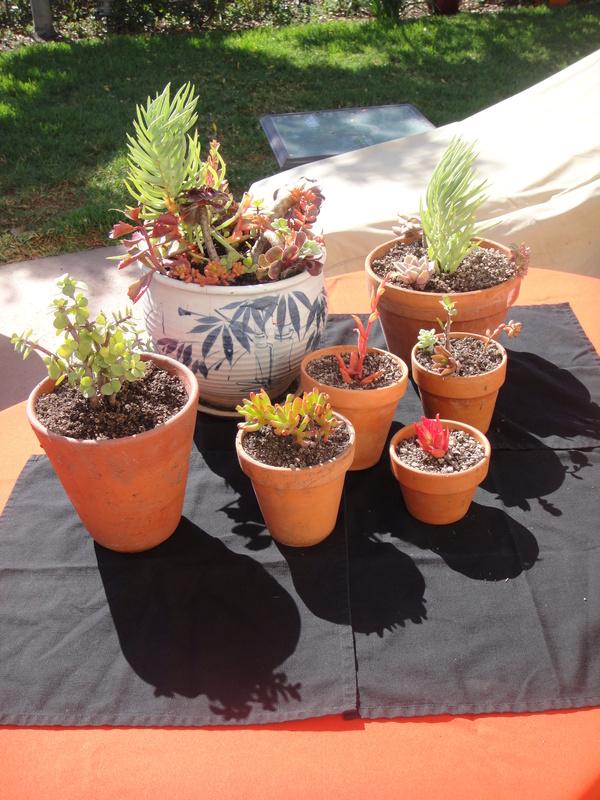 As they grow, I’ll transplant them to bigger pots and put them in the front gardens. My new plants are doing well after just one week in their new soil. When I feel blocked, frustrated, or limited by circumstances or people, my succulents inspire me. I consider the aeonium branch growing roots while dangling three feet from the ground an example of tenacious, creative adaptation. If my plants can adapt like this to new or adverse situations, so can we humans. All we need is our own version of “viable growth tissue” and a will to keep growing. This entry was posted in Coping, Happiness, Life in General, Resilience and tagged Adaptation, Creativity, Resilience, Succulents on March 10, 2014 by Barbara Anderson. I have started planting succulents in a hard-to-get strip south of the house and next to the neighbor’s driveway. What is surprising is that now some are sending up bloom stalks.